It's official: Fall is here, and if you're anything like me, you love warming up with a hot drink. Well, our espresso beverages are a great way to do that. We have a great selection of lattes, chai tea, and espresso milkshakes year-round, but the incoming chilly weather makes our hot drinks especially tempting. One of my favorites is our Pumpkin Chai Tea, which is only available for a limited time. Made with Oregon Chai Tea, Torani Pumpkin syrup, and a sprinkling of cinnamon, the Pumpkin Chai really gets me in the mood for fall. Our new Hazelnut Latte is another great new item. Of course, you can't forget about our other classic favorites, like the Caramel Latte, Caffe Mocha, or our Cappuccino. At Eat'n Park, all of our espresso beverages are prepared to order, just like at your favorite coffee shop. Plus, we have your choice of 1%, skim, or soymilk. Click here to see our online espresso menu. Enjoy a Great Meal and a Discount When You’re on the Road! Recently, one of our guests wrote about our hotel discounts in her blog. It was then that it occurred to us that even though we’ve been offering this program for years, many Eat’n Park fans are not aware that they can receive a discount at Eat’n Park when staying at partnering hotels. Just show your hotel room key at any of the locations below to receive 10% off your order. Thanks to Joyce at Rejoice in Saving for bringing this to our attention. Click here to read her blog for some other great deals. Looking to find the location and hours of operation for the nearest Eat’n Park? Use our restaurant locator to find the address, hours of operation, phone number, and takeout menu for the Eat’n Park location nearest you. Just click here to use the locator. You’ll need to enter your zip code, and our restaurant locator will let you know which Eat’n Park locations are closest. You can view (and print, if you wish) a takeout menu, as well as get the phone number so you can place your order. Fall can sometimes bring about the chaos of adjusting to new schedules, especially when someone in your household is heading back to school. However, this time of year also brings us Eat'n Park's Fall Specials! Just like the rest of our menu, our fall specials are available to go. That means that Eat'n Park is your one-stop-shop for meals to make the whole family happy. Our takeout is already a great value, but we'll sweeten the deal even more with this special coupon for our fans: $5 off your next $20 takeout order! Just click here to print the coupon. This offer is good through September 30, 2009. Don’t look now, but fall is just around the corner. Really! School has started, the air conditioners are being shut off, the nights are downright chilly, and I am starting to see leaves in my yard. Stuffed Mushroom Caps – What a great appetizer! These locally-grown mushroom caps are brimming with our own crab and seafood stuffing…perfect to share on a chilly evening when out with friends before or after a show. Chef's Cobb Salad – This salad has the look of autumn with its layers of colorful ingredients, but still gives us the feel of summer. Rows of diced ham, American cheese, hard-boiled egg, ripe tomatoes, crisp cucumbers, Swiss chesse, and turkey over mixed greens. Gorgeous! Gourmet Grilled Cheese and Tomato Soup – Nothing’s better than this combination to take you home again, even if you are away on business or at school. We spice up the traditional grilled cheese sandwich by using our grilled six-grain bread and adding bacon to melted American, Swiss, and Pepper Jack cheeses. Served with a grilled-cheese sandwich’s best friend: hot, creamy Campbell’s Tomato soup. Baked Ziti and Sausage – Roasted sausage, tender pasta, and rich sauce all baked together with a topping of mozzarella cheese. Does it get any better than that? Turkey Dinner – An Eat’n Park favorite as long as I have been around (and no, I’m not telling you how long!). Tender-roasted turkey breast with stuffing, gravy, and cranberry sauce. Ahh, comfort food. Chicken BLT – This is a great hearty sandwich, and it is served on our one-of-a-kind six grain bread. Skinny Scrambler – Breakfast never felt so good! Multi-grain bread, healthy egg substitute and lean Canadian bacon, served with a side of fresh fruit. It’s Eat’n Smart! Texas Scrambler – Hearty, if not entirely healthy! This is our scrambler on steroids. Two scrambled eggs, two slices of American cheese, lettuce, tomato, and your choice of meat, stuffed between two slices of grilled Texas Toast. Plus, your choice of potatoes on the side. Bring your appetite if you are ordering this one! Chicken Cordon Bleu – I have left my favorite for last. Hand-breaded and baked chicken topped with layers of thinly sliced ham, Swiss cheese, and a touch of white wine butter sauce. It’s delicious! It’s been a busy summer, and the days are getting shorter. Give yourself a break, stop by an Eat’n Park, and let us do the cooking for you. You won’t be disappointed. $10,000 Grand Prize: And the winner is…. Cindy W! Cindy, a postal service worker, lives with her family in Toronto, Ohio. Although Cindy took the top prize, she had quite a bit of help in doing so! Cindy’s mother-in-law actually received the winning ticket with her meal at the Steubenville Eat’n Park Restaurant. Since Cindy’s mother-in-law doesn’t have a computer, she asked Cindy to enter the ticket into the sweepstakes. Cindy promptly entered the code and the rest is history! In fact, the ticket was still sitting next to her computer when she received the call notifying her that she was our grand prize winner. Cindy split the grand prize with her mother-in-law, donated 10% to her church, and stashed the rest away for a rainy day. There’s nothing quite like getting back to your roots! On Saturday, August 29, Team Smiley stocked the Cookie Cruiser with a LOT of Smiley Cookies and hit the road for Titusville, Pa. 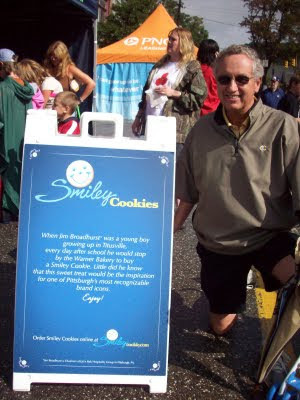 This small city in Northwest Pennsylvania is the childhood home of Eat’n Park’s Chairman of the Board, Jim Broadhurst, and also the birthplace of our Smiley Cookie. On this particular day, Titusville was celebrating the 150th anniversary of the discovery of oil in the city. We naturally wanted to join in the celebration! We had the best spot in town, parked right in front of Warner’s Bakery…where it all began! 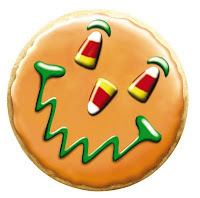 When Jim was a boy, he would stop by Warner’s Bakery every day on the way home to enjoy a happy-faced sugar cookie. Jim loved the cookies so much that as an adult, he wanted to give kids visiting Eat’n Park the same feeling (click here to read Jim's story). It was great to meet the people of Titusville and to hear their stories and memories about Warner’s Bakery and those famous happy-faced cookies. It was a wonderful day filled with fun, new friends and so many great memories. Click here to check out photos from the festivities. Below, Jim poses next to the story of the Smiley Cookie in one of our favorite photos of the day. Local farmers are busy harvesting their crops, and at Eat’n Park, that means that our guests are enjoying a bounty of fresh produce thanks to our FarmSource program. The seedlings I saw during my spring farm tour (click here to read that post) are now producing fresh fruits and veggies that we’re featuring daily on our salad bar and in our menu items. Click here to see photos of these bountiful fields from my summer farm tour. It’s hard to believe that the FarmSource program has been up and running for seven years now. Besides the obvious benefit to our guests, I’m happy to say that the support that FarmSource provides to local farmers has kept at least one farm from disappearing. I met Aaron Schwartz back in 2002 at a Pennsylvania Association for Sustainable Agriculture conference. Aaron is an Amish farmer from Sligo, PA, and after the conference, he hitched a ride to our offices to talk more about the program I was developing. Aaron’s farm is a little off the beaten path, and he was eager to get his produce into the Pittsburgh market. He explained that unless I could help him, he was getting out of farming. At the time, a bushel of his zucchini was earning him 75 cents at the local farmer’s market, and the box needed to hold the zucchini was costing him 25 cents. Eager to help my new friend, I convinced Paragon Food Service, one of Eat’n Park’s suppliers, to make a new stop on their regular routes. Today, the hand-breaded fried zucchini at Eat’n Park comes from Aaron’s farm. Additionally, you can find his melons at Giant Eagle and his organic fruits and vegetables at Whole Foods Market. After that first year of using Aaron’s produce, he invited me out to his land to enjoy a meal with his family. Fresh chicken, apple pie, and goats milk rounded out the delicious menu, and we had a wonderful time eating and celebrating the success of our partnership. Afterward, Aaron and I were touring the farm when I noticed a bulldozer in the distance. I soon learned that Aaron was putting in a loading dock to make his farm more accessible for the food trucks used in wholesale trade! It was amazing to think that just a year before, Aaron had been on the verge of giving up farming. As this program continues to grow, I look forward to sharing more stories like Aaron’s. We currently partner with over 20 local farms and dairies through FarmSource, and I’m constantly working to develop new partnerships. 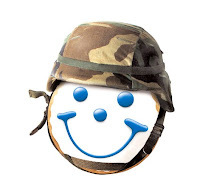 To see a map and links to our partners, just click here. And to find out more about Aaron’s Rippling Brook Farm, just click here. Labels: FarmSource Partners, Sustainability, What's on the menu? Looking for Eat'n Park coupons? Here on our blog is a good place to start. We often post coupons for our blog readers, so check back frequently. Click here to check out the coupon section for our most recently posted coupons. The best (and most convenient) way to get Eat'n Park coupons is to sign up for our email club. You'll get a coupon just for signing up, plus a special coupon for your birthday and for your anniversary. Additionally, we often include special offers in our monthly newsletters. Just click here to join now! Our Facebook fans and Twitter followers also get exclusive benefits like coupons and notifications when we have special offers. Click here to become a fan on Facebook, and here to follow us on Twitter. Eat’n Park Burgers Recognized as “Best in the Nation”! Are you ready, Eat’n Park fans? We have some really exciting news to share with you! 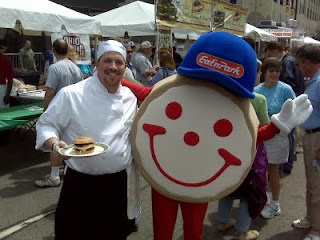 On July 18 and 19, Eat’n Park participated for the second year in the National Hamburger Festival in Akron, OH. Not only did we have a great time serving our famous Superburgers to all of the hungry festival attendees, but we were ecstatic to learn the results of the 4th Annual Best Burger Competition. And the winner is….drum roll, please……our Black Angus Mushroom and Onion Burger! This fantastic burger, made with chargrilled, seasoned Black Angus beef and topped with grilled onions, mushrooms and Swiss cheese, took first place in the Best Traditional Burger category. And, for the second year in a row, our Black Angus American Grill Burger placed in the Best Creative Burger competition. The American Grill Burger is served on grilled Texas toast and topped with grilled onions, green peppers, mushrooms and American cheese. Then, we finish it off with just a hint of yellow mustard….delicious! If you haven’t tried these burgers, be sure to order one the next time you visit an Eat’n Park so you can find out for yourself why the judges love them so much. We'll even sweeten the deal: order the Black Angus Mushroom and Onion Burger between August 24 and 30, and we'll give you a free Smiley Cookie! Just print the coupon below to redeem this offer. And don’t forget to make plans for next year to come and visit us at the National Hamburger Festival. If you would like to learn more about the festival, visit the website at http://www.hamburgerfestival.com/. To see our complete list of burgers, along with our entire menu, just click here. Chef Reuben and Smiley had a great time serving burgers to hungry fans! From the moment you step into our newly remodeled Morgantown restaurant, you’ll know you’re in West Virginia! From the framed West Virginia University football and basketball jerseys hanging on the wall behind the new counter to the blue and gold upholstery and carpeting, it really feels like West Virginia. We are excited to share the “before” and “after” photos with you, below. You will love the dramatic changes to the lobby area and the addition of a meeting space, for the comfort and convenience of all of our guests! There are many other updates that we haven’t listed or pictured here so be sure to stop by and check it out for yourself. Hopefully, you recall my spring posting, "Farm Tour 2009". Well, I’m back with an update. How things have changed since those early days of spring! In the spring, the fields were just being plowed, and in some cases, seeds hadn’t even been sown yet. It's a wonderful sight to look out at these same formerly barren fields and see how they are flourishing. In most cases, the fields are filled with some really gorgeous looking veggies. As you can tell by now, I enjoy visiting with our farmers, so for my summer tour, my first visit was to Cedar Meadow Farms in Holtwood, PA. This farm is doing some pretty creative things when it comes to getting the most out of their plantings. The owner, Steve Groff, recently received a Sustainable Agricultural grant to experiment with grafting tomatoes, which is a technique that is commonly used for apple trees. Grafting in tomato production is used to increase the resistance to soil-borne diseases, and it also increases fruit production due to the increased strength of the plant. Basically, they take a very hearty and disease-resistant root stock from one variety of tomato, and graft it to the fruit-producing shoot of another variety of tomato. This yields a very prolific and quality tomato. As you can see, Steve’s grafted tomatoes are doing quite well. I then went Brenckle’s Farm and Greenhouse in Butler, PA. This time, I visited the farm and not the greenhouse. I met with Don Brenckle and had an opportunity to see the fields and variety of vegetables that he grows. One of the items that I saw was zucchini. These plants were 4 feet tall had tons of yellow flowers on them. This particular field had already been picked but the plants were again producing more fruit for future harvesting. Some of the other fields that I saw were corn, celery, red onions, eggplant and lastly, tomatoes. Every one of the fields was producing an abundance of produce, except for the tomatoes. Don said that his tomatoes were growing unbelievably well, and then on the evening of August 4th, things went south. That evening, he noticed a white powder that was forming on the leaves of the tomato plants. Overnight, these plants turned brown and large blisters were found on the tomatoes. This highly contagious fungus destroyed all of the tomato plants in one of his fields. The spores of the fungus, called late blight, are often present in the soil, and small outbreaks are not uncommon in August and September. But the cool, wet weather in we had in June and the aggressively infectious nature of the pathogen have combined to produce an explosive rate of infection this year, specifically in the Northeast and Mid-Atlantic States. Below is photo of what the tomato plants looked like when they were affected by the blight. Thankfully, only one field was affected by late blight, and we have our fingers crossed that no other fields will be hit by the outbreak. Though Don’s tomato crop was lost, we are fortunate that our other local suppliers were not affected, and we’re still able to offer our guests healthy, delicious locally-grown tomatoes throughout this month and hopefully in to September. My visit with Don was a reminder of the challenges faced by our local farmers, and how our FarmSource program can help sustain them when something like the late blight takes a toll on their production. Our FarmSource program ensures these farmers with a dependable income to support their families and their farms through the next growing season. They’re back: Our delicious mini desserts pack a lot of flavor into a small package. And they’re good for your wallet at only $1.49 each. You can even try all 3 for only $4.00! We’re sweetening the deal even more for you, our blog readers. Just click here to print this coupon, then bring it to Eat’n Park now through August 21 to get a FREE mini dessert with your dinner. There are three great flavors to choose from: Bananas Foster’n Crème, Strawberry Pie’n Crème, and Fudge Brownies’n Crème. See what’s fresh and local at Eat’n Park this week, courtesy of FarmSource, our local purchasing program.